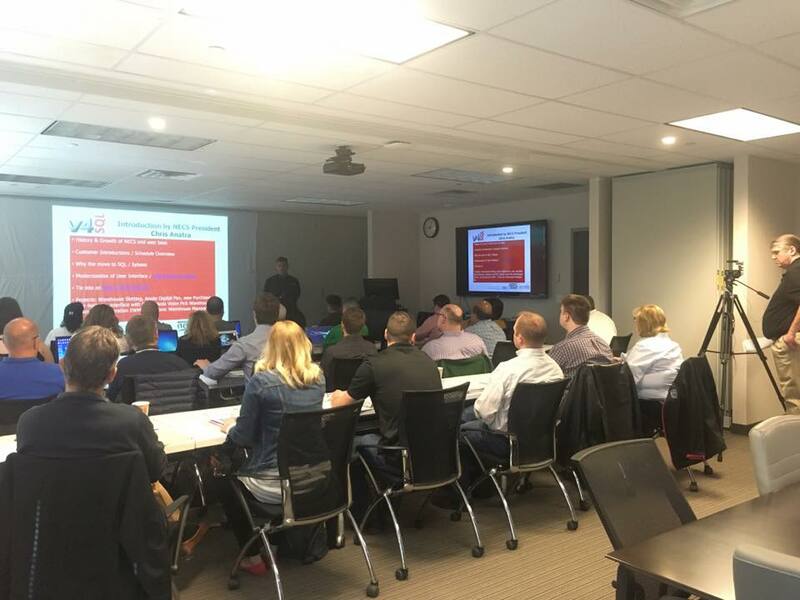 The last week in April, we spent three days hosting our in house training session of Spring 2016. On Wednesday, we welcomed 27 new, returning, and potential entrée users. The recent move to our new offices was just in time, as this is the largest training session we have ever held- almost double the previous one! We were a little worried about being able to accommodate such a large group but were even more excited about the opportunities this would give us to hear feedback from so many current entrée users. We had food distributors from California, Michigan, Texas, New York, New Jersey, Illinois, Maryland, Massachusetts, Georgia, and even locals from Connecticut. Below you can see the group and the space we prepared for the large class. I want to take the opportunity to thank all of you who traveled to be here, your participation is a key part of improving entrée. 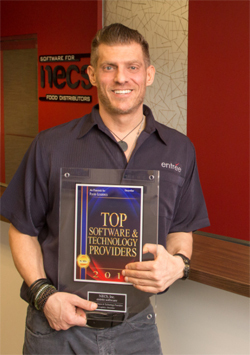 Here at NECS, we are proud that our customers praise how "user friendly" entrée is. If you have not attended in house training before, I strongly encourage you to join us next time. 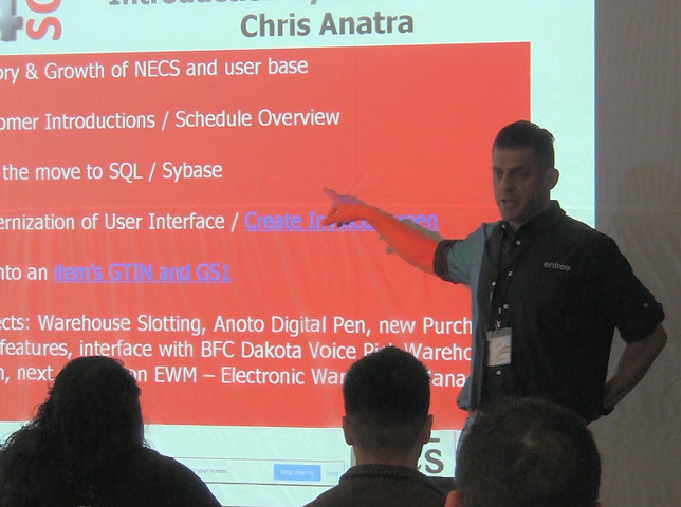 When everyone arrived on Wednesday, we began with introductions and a brief history about NECS. I then began to introduce the possible future of entrée by sharing my experiences from the MODEX Show, which I blogged about last. I introduced the newest and upcoming warehouse innovations from the show and talked about how they could be incorporated into future versions of entrée , like I did in my post from the other week. I wanted to gauge customer interest in these technologies and hopefully try to forsee any potential problems with the application of these products. Speaking of problems... During the second half of the day, we experienced some technical difficulties of our own. We purchased a new projector in anticipation for the larger class size and were a little unfamiliar with it. Also, we had ordered a very large projector screen which wasn't delivered on time, so we put a make shift screen on the wall. After some minor roadblocks, we completed a successful first day of training and sent everyone home to rest up for Thursday. Thursday we began with a hearty breakfast (pictured below) before really got into the details of using entrée. We did not experience any more technical difficulties so the day was thankfully uneventful. This meant that the most exicting part of training was... FOOD! 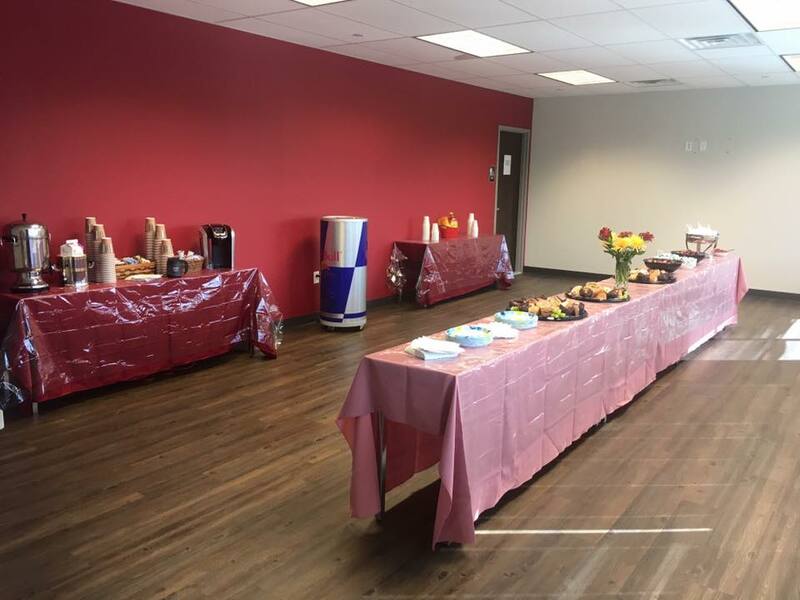 During in house training we provide breakfast, lunch, desserts, and snacks that alone are enough reason to join us for next time. We setup the food in what is soon to be our workout room / yoga studio. We truly would love to see you at our next training session (which we have scheduled for June 22-24). Even if you are a long time entrée user, you can not only provide us with your valuable feedback, but you can also learn about new features, and be reminded of old ones. For example, we were surprised to hear that many of our users had forgotten about the built in keyboard shortcuts. If any of you forgot about this as well, you will notice within entrée, many words contain underlined letters- these signify a hot key function is available. Simply press 'Alt' and the underlined letter as a shortcut for that function. This will often bring up more hot key options, allowing you to use most of the entrée system completely from your keyboard. On Friday, everyone trudged in slowly. It took a while for the energy to pick up. I think everyone was exhausted from the influx of information they received the day before. 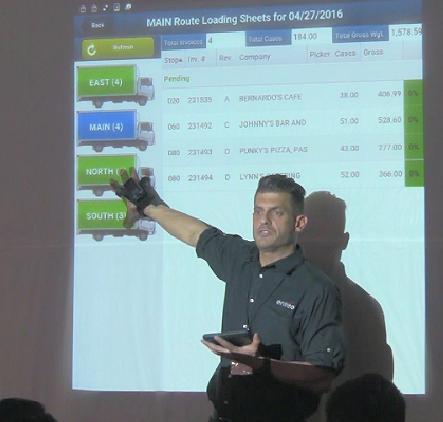 Energy was heightened when I demonstrated how to use our Electronic Order Pad. I also covered our Electronic Warehouse Manager called EWM. 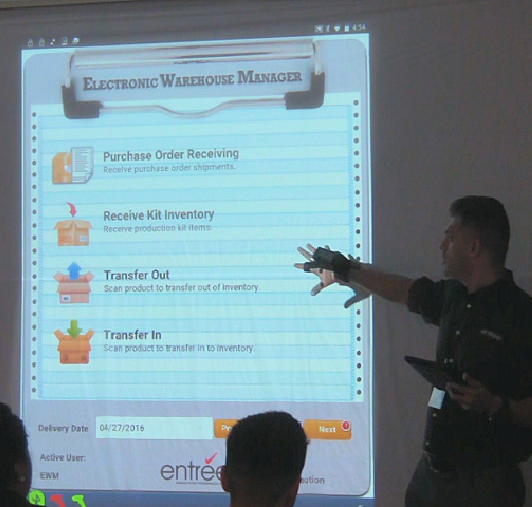 I was able to demonstrate our new barcode scanning glove, for a more hands free use of EWM. Then the moment we had all been waiting for arrived! That's right.... Pizza! 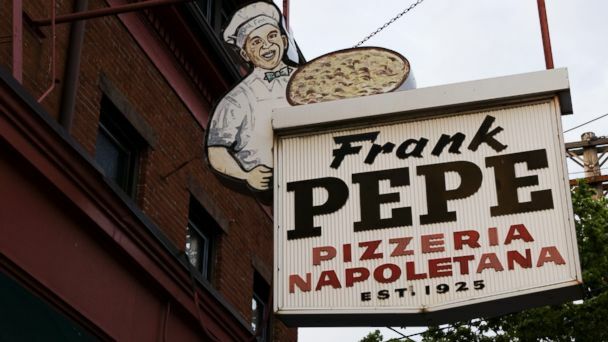 We indulged our guests in some Frank Pepe's pizza, a local favorite. 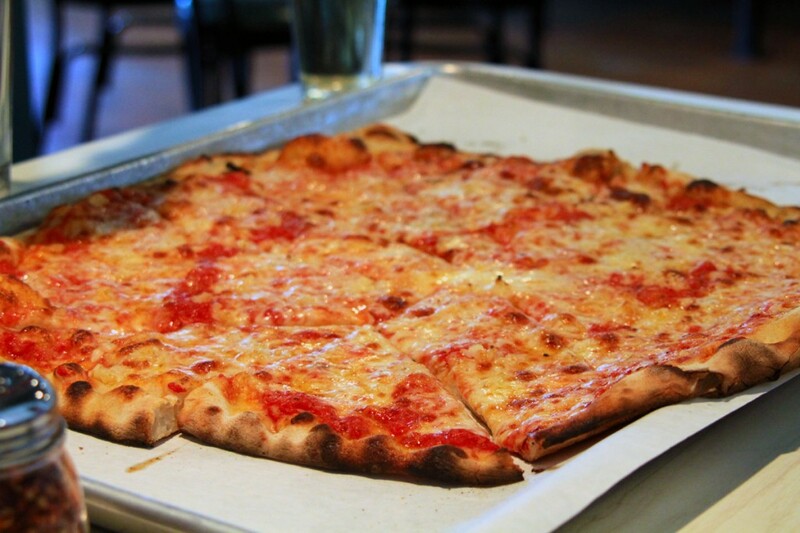 There was some regional dispute, but New Englanders prefer crispy, thin crust "Apizza", pronounced "Ah-Beets". Even with full stomachs, the energy (and questions!) continued for the rest of the afternoon. With such a large group, there were more comments and questions than planned for so we got a little off schedule. Many people had to leave to catch flights home so we donned our caps and gowns, and passed out training certificates early. We are keeping this in mind as planning for the next training starts. Perhaps breaking out into small groups would be more beneficial and allow for personalized attention- we want to utilize the short time we have to work with customers individually. The numbers dwindled as we talked about entrée.QB, entrée.AP and entrée.GL. If anyone has questions about those sections, feel free to contact us. With the remaining group, Mike Fitzgerald, our web designer gave a presentation on how NECS can build a website for your business. If you click on the image below, you can see an example site from one of our customers. 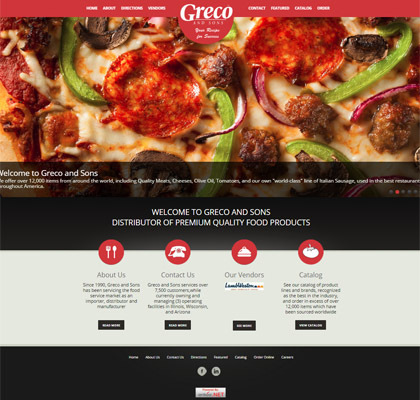 While multiple other companies can build a website, only we are able to upload your catalog directly from your entrée software. We can also provide an entrée.NET login window for your customers so they can place an order directly from your site. Last week, we attended the Dot Foods Show- it was a pleasure to see some of you there. The show was another great opportunity to connect with our existing customers, and meet some new potential clients. For those of you not at the show, be sure to check back later this week for a blog about the highlights from our experience in St. Louis!